A project that starts off on the right foot has a much greater chance of being a success once complete. That’s why we’ve established an efficient, proven pre-press process to help keep your project on schedule while ensuring the results you desire. This process also saves time so you’ll see the savings in costs. We combine speed, accuracy and quality by using state-of-the-art software and hardware designed to meet rigorous color and special effects demands. Other workflow systems may rely on larger file sizes, which can cost precious production time. Although many will send us PDF files, if you send another file format like an .EPS file, and it needs to be converted, our system allows us to quickly and accurately accomplish this and keep your project on schedule. Regardless of the file type, we’ll accept your work and incorporate into our production processes. Every job that enters our production facility is typically reviewed within one hour. Once files arrive via FTP, email, flash drive, or disk, we determine if any elements are missing, or if there are any structural problems within the files. We carefully examine what we receive and compare the job to its original quoted specifications. We also check for correct resolution and physical dimensions. After inspecting each file, we will contact you right away to make you aware of any problems. If the file is accurate, it moves immediately into the proofing stage. After our prepress technicians work on your file, you’ll receive a color accurate proof. You’ll also receive a mechanically accurate proof so you will know what the piece will look like after folding, die cutting, saddle stitching or whatever post-press options you require. 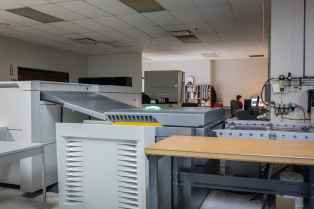 We use Epson inkjet digital proofers supported by the Oris color management system. Both devices are carefully calibrated to our presses so what you see on the proof will match what you’ll later see on press. Contact Us today to speak with one of our account representatives or service representatives with questions about our pre-press services or any other tricky issues you are dealing with. We are happy to help in any way we can.